One of my favorite places on the Peninsula is the little town of San Carlos. I love Laurel Street. We were just there a few days ago eating at our favorite restaurant, Town. What makes Laural Street unique is the unique shopping experience. There are so many fun shops. Sassy Chic Boutique is one of those shops. With today’s Juice in the City deal you can get $40 worth of clothing and accessories for only $20 from Sassy Chic Boutique. If you haven’t been to San Carlos lately, grab this deal and head over there. You won’t be disappointed! 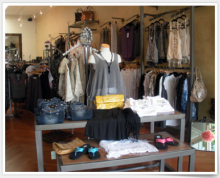 Daily deals Aug 2, 2011 in clothing, fashion, JITC · Expired! Kate Spade is having an awesome sample sale. Everything in this sale is up to 75% off. Did I mention that shipping is only $5 on all orders? This sale is going on until February 26th, so don’t wait. You will need to sign in with Kate Spade here. Also, supplies are limited and all sales are final. Offers Feb 24, 2010 in fashion · Expired!